Basmati rice with spices. Marinated chicken breast in a spiced cream, tomato and cashew nut paste sauce. Marinated chicken in a tomato and chilli sauce. Naan bread with onion seeds.Fried onion with spices. Working in partnership with expert Indian chefs we use traditional layering methods to create depth of flavour. Instructions: Oven 190°C/Fan 170°C/Gas 5 20-25 mins Pierce film lids several times on the chicken tikka masala, chicken jalfrezi and pilau rice. Remove all packaging from the naan bread and onion bhajis. 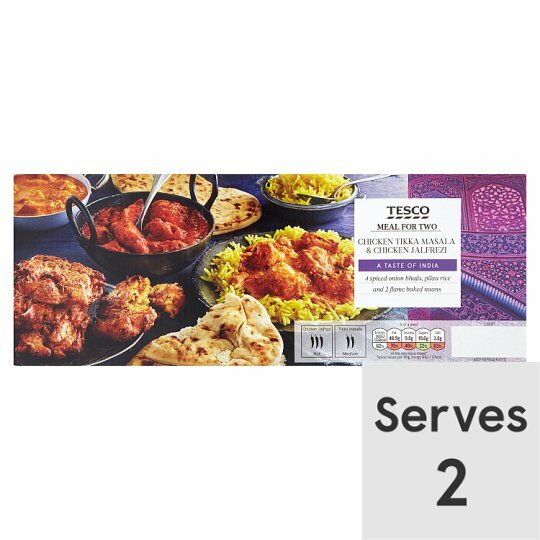 Place the chicken tikka masala, chicken jalfrezi and pilau rice on a baking tray in the centre of a pre-heated oven for 5 minutes. Add the onion bhajis to the baking tray and heat for a further 15-20 minutes. Sprinkle the naan bread with water and place on the baking tray for the final 5 minutes of heating. Stir the chicken tikka masala, chicken jalfrezi and pilau rice well before serving with the onion bhajis and the naan bread. Instructions: Onion bhajis and naan bread are not suitable for microwave heating. Each container must be heated separately. Pierce film lid several times. Heat on full power for 4 minutes (800W)/3 minutes 30 seconds (900W). Stir well before serving. Pierce film lid several times. Heat on full power for 3 minutes (800W)/2 minutes 30 seconds (900W). Stir well before serving. Suitable for home freezing. Ideally freeze as soon as possible after purchase but always by 'use by' date shown. Not suitable for heating from frozen. Defrost thoroughly for a minimum of 12 hours in a refrigerator.Once defrosted use on the same day and do not refreezeFollowing the preparation guidelines opposite. Caution: Although every care has been taken to remove bones, some may remain.Caution: This product can contain small fibres which come from the ginger purée.Caution: This product may contain whole spices which should be removed prior to consumption. Marinated chicken in a tomato and chilli sauce. Naan bread with onion seeds. Marinated chicken breast in a spiced cream, tomato and cashew nut sauce. Chicken Breast (37%), Onion, Single Cream (Milk), Tomato Purée, Yogurt (Milk), Rapeseed Oil, Ginger Purée, Garlic Purée, Ground Cashew Nut, Honey, Butter (Milk), Cashew Nut, Salt, Coriander Leaf, Sugar, Soya Oil, Palm Oil, Cornflour, Paprika, Coriander Powder, Green Chilli, Cumin Powder, Turmeric Powder, Chilli Powder, Black Pepper, Colour (Paprika Extract), Cinnamon Powder, Clove Powder, Cardamom Powder, Fennel, Bay Leaf, Ginger Powder, Mace, Star Anise, Fenugreek, Basil, Lemon Oil, Sunflower Oil.